COLOGNE, Germany, Sept. 20, 2016 (GLOBE NEWSWIRE) — Lexar, a leading global brand of flash memory products, today announced two new microSD™ readers: the Lexar® C1 microSD Reader and the Lexar M1 microSD Reader. On display at Photokina 2016, the new C1 and M1 microSD Readers allow users to easily offload content from their sports camcorder or aerial camera to their devices. 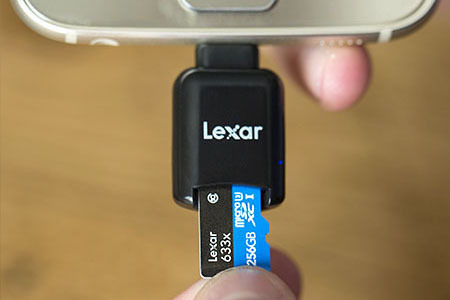 The Lexar C1 microSD Reader is a small, compact reader designed for devices with a USB Type-C (USB-C) connector port, enabling users to freely transfer, view, and play back photos and videos on their smartphone or tablet. The Lexar M1 microSD Reader is equal in size and portability, but is designed for devices with a micro-USB port, such as Android™ smartphones and tablets. The new microSD readers also expand the memory of USB Type-C or Android and other micro-USB devices. By offloading files, users can store more on their microSD card, giving them the extra space to capture more content on the go. With the Lexar C1 microSD Reader, content can be transferred at premium speeds, leveraging USB 3.1 (Gen 1) technology for fast file transfer. * These small, portable readers are great multitaskers, providing a convenient way to expand the memory of your device, swap content between devices, or archive your favorite content. All Lexar product designs undergo extensive testing in the Lexar Quality Labs, facilities with more than 1,100 digital devices, to ensure performance, quality, compatibility, and reliability. The new C1 and M1 microSD Readers are coming soon, with MSRPs of $12.99 and $9.99, respectively, and include a one-year limited warranty. For more information about Lexar products, visit www.lexar.com. Lexar will showcase its latest high-performance memory solutions, including the new C1 and M1 microSD Readers, at Photokina 2016, Hall 2.1, Booth B030. Lexar Announces 1TB 633x SDXC™ UHS-I card, the behemoth of storage capacity.